OPEN is a backwards-designed curriculum developed under the direction of Aaron Hart, a physical educator and faculty member at SUNY Cortland. OPEN is supported by US Games, making it available for FREE. Learn more on page 8. 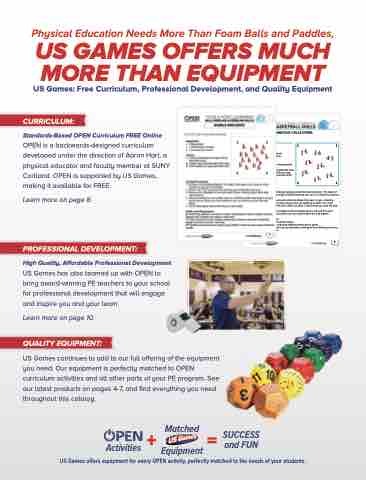 US Games has also teamed up with OPEN to bring award-winning PE teachers to your school for professional development that will engage and inspire you and your team. Learn more on page 10. US Games continues to add to our full offering of the equipment you need. Our equipment is perfectly matched to OPEN curriculum activities and all other parts of your PE program. See our latest products on pages 4-7, and find everything you need throughout this catalog. 2. Scatter poly spots throughout the area. 3. Pair students, scattered in the area. knuckle-bumps from the other players who are standing on spots. You must continue your dribble while you collect knuckles. Freeze when you hear the stop signal. 3. You’ll have 2 minutes to collect as many knuckles as you can and then we’ll switch. How many total knuckles can you collect before the stop signal? 3rd: Play the activity as it is written above. 4th: Introduce a signal for changing dribbling hands and/or speed. 5th: Choose 1 or 2 students to act as defenders, working to force dribbling errors by adding defensive pressure. US Games offers equipment for every OPEN activity, perfectly matched to the needs of your students.